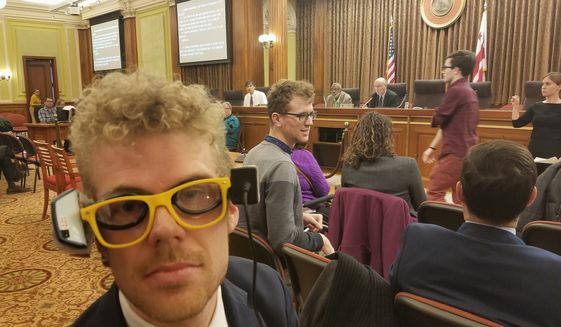 The D.C. Council plans to reintroduce legislation that would require movie theaters to provide more open caption screenings, after a Tuesday hearing in which dozens testified about frequent failures of captioning glasses. Theater operators expressed worry about losing revenue with more captioned screenings, but lawmakers questioned their data and indicated renewed support for the Open Movie Captioning Requirement Act of 2018. The council’s public hearing on Tuesday was aided by four American Sign Language interpreters and live captioning. Every witness who was deaf and hard-of-hearing testified about how glasses that display captions stop working, run out of sync with a movie or are not available. Theaters provide the glasses in compliance with the federal Americans with Disabilities Act. “My first open-captioned movie when I first moved here to D.C. in the fall of 2016, I was able to follow the dialogue and I was able to fully enjoy the story instead of struggling to get all the different small details that I missed,” said Emily Fustos, an audiologist at Children’s National Medical Center. Movie dialogue and voice-over appear on screen in open-caption presentations and can be seen by all viewers. Captioning glasses provide dialogue only for the wearer. This article is originally posted and taken from The Washington Times.